One of the biggest drawbacks of using your PC on your TV is that things that look great when you’re sat 30-40cm (12-16″) from your monitor, often look rather small when you’re sat several meters away on the sofa. To change the screen resolution in Windows XP, right-click anywhere on the Desktop to bring up the Display control panel and select Properties then the Settings tab. In Windows 7/Vista, right-click on the Desktop and select Screen resolution. With the Display control panel still open, you will also have the opportunity to increase the size of the text and icons used by Windows. In Windows XP, select the Appearance tab and change the Font Size option at the bottom of the dialogue. In Windows 7/Vista, click “Make text and other items smaller or larger”. 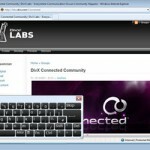 If you are using ConnectedVNC to browse the web, zoom controls are available by selecting View > Zoom from the menu in Firefox, or by clicking on the magnifying glass in the bottom-right corner of Internet Explorer. 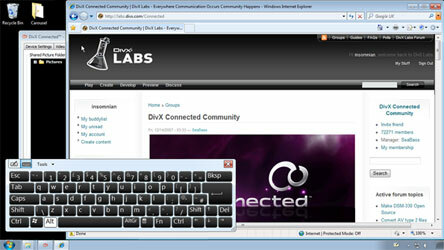 ConnectedVNC is a free VNC client that allows you to control your Windows PC from your television using your DivX Connected set-top-box. ConnectedVNC allows you use your PC from your TV, so you can do things like check your email and browse the web without having to leave the comfort of your arm chair. To use the ConnectedVNC plug-in, you need to install a VNC server on the same PC as the DivX Connected server software; we recommend UltraVNC. Once installed, open Admin Properties by right-clicking on the system tray icon, create a password (middle-left), tick the box next to “Allow Loopback Connections” (top-left) and click OK.
That’s it! You’re ready to use ConnectedVNC. To use ConnectedVNC, simply navigate to the Plug-ins menu, or press the orange button on your remote control, and select ConnectedVNC. On the first screen, highlight the password box and press ENTER on your remote control to bring up the on-screen keyboard and enter your password, then navigate to DONE and press enter. Now, simply press down on your remote control to highlight the Login button and press ENTER. If you have entered the correct password, the desktop of your PC should appear. After you click the Login button, you might see a “Connection Error” or “Invalid Password” error; a connection error usually occurs because the VNC server is not running or is being blocked by a firewall. Either way, simply press BACK to try again. ConnectedVNC contains code from the FVNC project.